The new routemaster bus is starting its rounds of London’s streets today, although for some reason only one is operational at the moment. In 1914, the British were rather better at getting their buses into action – quite literally, as many were taken from the streets of London to the roads of France and Flanders. The scars of the bombing of the Second World War can be seen across London: in a small number of ruins left standing, some scarred buildings, and the flurry of post-war construction where buildings were lost (as in the case of Percy Gayer’s street in Pimlico). There is less sign of the German bombing campaign in the First World War, but remnants and reminders do appear: the most prominent is at Cleopatra’s Needle. When we read of men overseas in the armed forces, we tend to assume that they were all risking their lives all of the time. Even the infantry spent much of their time in training or in reserves. Some men were much more fortunate, being stationed miles from the battlefields. Sergeant P.E. Gayer was one of them, combining being a musician with service in the Royal Flying Corps to stay well away from danger. At a charity fete in 1916, the people of Stepney adapted a German patriotic money-raising gimmick to support British troops with their own ‘Iron Hindenburg’ statue. 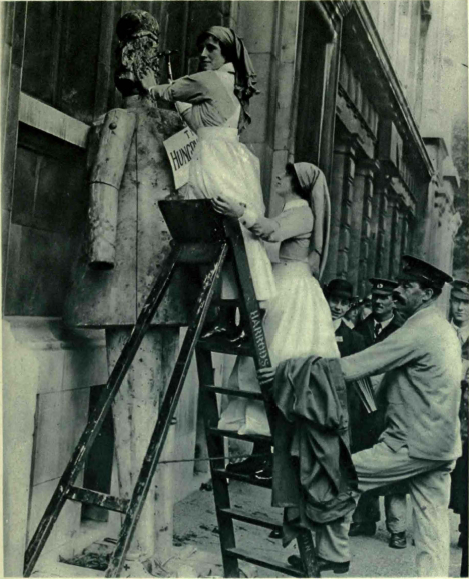 "Hard hits at Hindenburg: driving them home"
This picture from the 27 September 1916 Illustrated War News shows two nurses from Mile End Hospital knocking nails into a wooden figure depicting Paul von Hindenburg to help raise money for ‘our brave wounded and disabled soldiers’. One of these wounded soldiers is shown holding up their ladder (apparently borrowed from Harrod’s) while they do it. Wooden statues into which nails were driven were used in Austria and Germany from 1915: the Men of Nails. A particularly notable example was the 42-foot statue of Hindenburg erected in September 1915 in the Königsplatz (next to the Reichstag), in front of a victory monument to Prussia’s wars with Denmark, Austria and France from 1864-71. An academic article (here) recounts this event in Berlin: The Kaiser’s daughter-in-law unveiled the statue, to the sound of a choir singing Beethoven, and Chancellor Theobald von Bethmann Hollweg gave a speech. The Princess drove a golden nail into the Field Marshall’s name, the first of over a million nails driven into the sculpture by Germans giving money per nail to support the war effort. The ceremony was widely reported in the international press (NY Times). Somehow, it seems unlikely that such a great scene accompanied Stepney’s Iron Hindenburg (or that it lasted until 1919 like the Berlin one). The hero of Tannenburg was certainly not depicted quite so heroically in the statue and the nails were driven with anger and humour rather than respect. If the scene shocks the delicate susceptablities of the Germans, they will do well to remember that it was themselves who initiated this curious perversion of motive and method. Anger and humour were prominent in British attitudes towards the Germans in 1914-1918. This mockery of the Iron Hindenburg fits neatly into both categories. 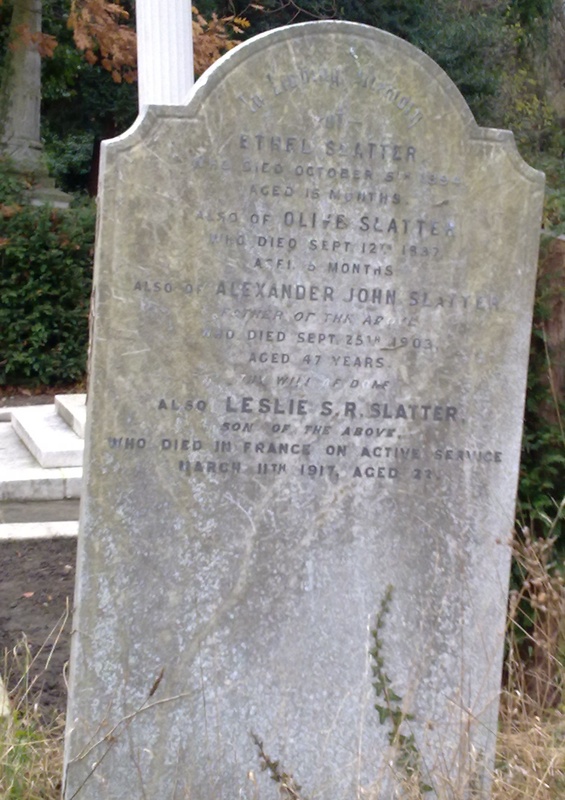 Adelaide Slatter brought up her children in Brockley in the three decades before the Great War. Her sons were exactly of the war generation – four of them served in the conflict, one of them never returned. The Slatter family’s story is at once both unique and similar to those of thousands with sons born in the 1880s and 1890s. The third name is Alexander, the girls’ father who died in 1903. The last name on the headstone is Leslie, who died on active service in 1917. It was not unusual for families to add the names of men who died on active service to headstones in the UK, either at the time or when the next headstone was needed (often a parent in the 1920s or 30s). War memorials are often referred to in academic discussions as ‘surrogate graves’ at which people can mourn someone whose body was not available for a normal burial. In the case of these headstone additions, the surrogate grave for soldiers like Leslie Slatter were actual graves, sites already used by the family to mourn their dead. Alexander B, born 1885 – a clerk in a motor agency in 1911. Dudley Clarence, born 1890 – moved to Canada in 1907. Cecil Howard, born 1896 – away from home in 1911 census. Leslie enlisted at Putney in the 3rd County of London Yeomanry, but I don’t know exactly when (it could be that he joined the unit before the war). He later transferred to the Royal Fusiliers and died of pneumonia in March 1917 while serving in the 9th battalion near Arras, France. They were part of 12th (Eastern) Division, who were moved to the area around Arras in January 1917 and attacked the Germans there in April (read more here). He was buried in the cemetery for No 6 Stationary Field Hospital at Frevent. The War Graves Project website has a photo of his grave in France. Cecil enlisted on 1 September 1914 and served with the 20th (Blackheath and Woolwich) Battalion of the London Regiment. He was wounded at some point in his service and was demobilised in April 1919. The battalion was part of 47th (2nd London) Division, which fought on the Western Front from May 1915 to November 1918 – the battles they took part in are listed here. Wilfred is listed as absent from home on military service in summer 1918 (in the electoral register), but I couldn’t track down any other records that were definitely him, so we cannot be sure exactly what he did. There is much more information about Aubrey: he enlisted in November 1915 and in June 1916 went to France with his regiment, the 2/13th Battalion (Kensington) of the London Regiment*. He was repeatedly sick in France and spent three months with a convalescent company. In November, his unit was sent to Salonika Front (in Greece) and in July 1917 they moved on to Egypt via Malta. They were part of the 60th Division, which fought in the Third Battle of Gaze, the capture and defence of Jerusalem in late 1917 and the capture of Jericho in early 1918. In May 1918 he transferred to the Royal Engineers (2nd (London) Field Company). Having been a draughtsman in civilian life, Aubrey worked as a draughtsman in the Engineers and was praised for the quality of his work when he was demobilised (see below). In August 1919, he eventually set sail from Port Said and returned to Brockley. Part of Aubrey's service record, noting that he was "an excellent draughter"
Like vast numbers families across the country, the Slatters sent several of their number overseas to fight for their country. Among Adelaide Slatter’s sons, four served: one was killed and one wounded but most returned. Their war stories were each unique but collectively they tell a familiar story of family service, survival and sacrifice. * 2/13th means that the unit was formed as the reserve battalion for the 13th Londons, who went out to France in November 1914. The excellent Long Long Trail website gives great summaries of units’ war histories,including the London Regt. Just over a week after Holocaust memorial day, February 4th marks a significant anniversary in modern Jewish history. Ninety-five years ago today, the first Jewish fighting unit since the destruction of the Temple in Jerusalem in the ninth century marched through the streets of London. It’s first wave of soldiers were East-Londoners and they were off to the holy land. After years of campaigning for a Jewish combat unit, the Jewish battalions were formed following the successful service of a Zion Mule Corps in Gallipoli in 1915. Officially, they were the 38th, 39th and 40th Battalions of the Royal Fusiliers, with the 41st and 42nd as their reserves. 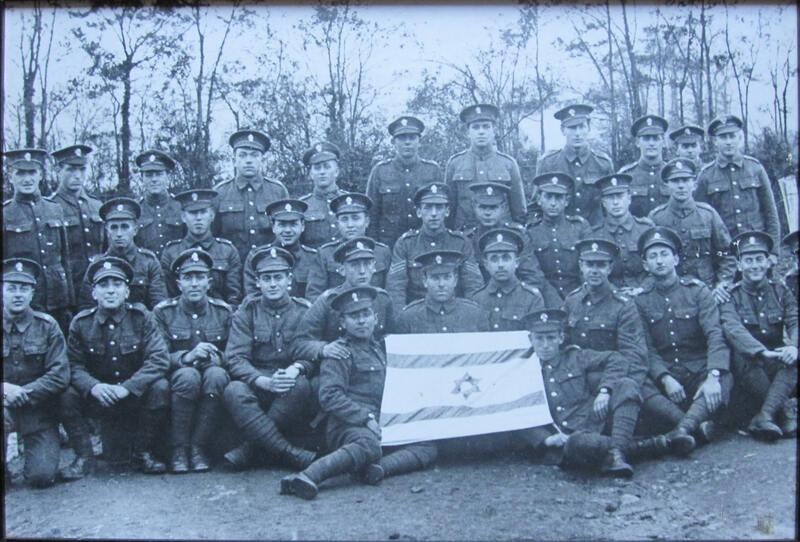 Men of the 38th Battalion, from the Jewish East End Celebration Society website. 38th: from East London or already serving the British Army. 39th: from the Americas – the USA, Canada and Argentina. 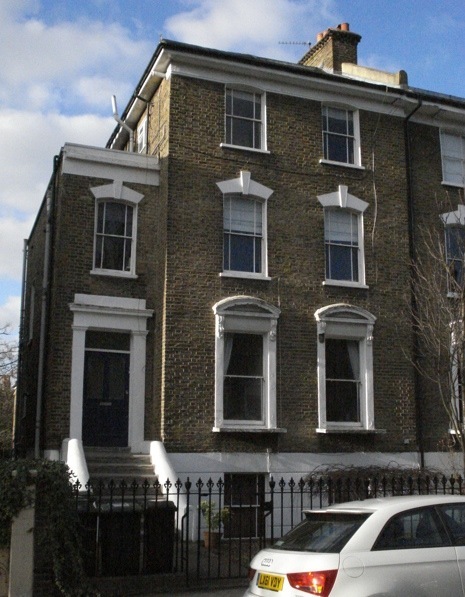 The Londoners in the 38th included refugees from the Russian empire who had fled the pogroms of the previous decade and become the largest migrant group in the UK in 1911. One of them was Polish-born Londoner Jacob Schneiderson, whose son tells his story on the Jewish East End website. Also among the soldiers of the Jewish battalions were the sculptor Jacob Epstein, the artist Bernard Meninsky, whose paintings of soldiers in London can be seen here, and the man who would become the first Prime Minister of Israel: David Ben-Gurion. French-born politician and philanthropist James de Rothschild, who had also fought in the French army, served as an officer in the 39th Battalion. After staying overnight in the Tower of London, half of the 38th Battalion marched proudly through central London and the Jewish areas of the East End and through the city on February 4th. Martin Sugarman gives an excellent, detailed description of the Jewish Regiment and their march here on the Virtual Jewish Library website. On the march, they were feted by crowds and celebrated by the great and the good of both the Jewish community and the English establishment – including being welcomed to the Mansion House by the Lord Mayor of London. 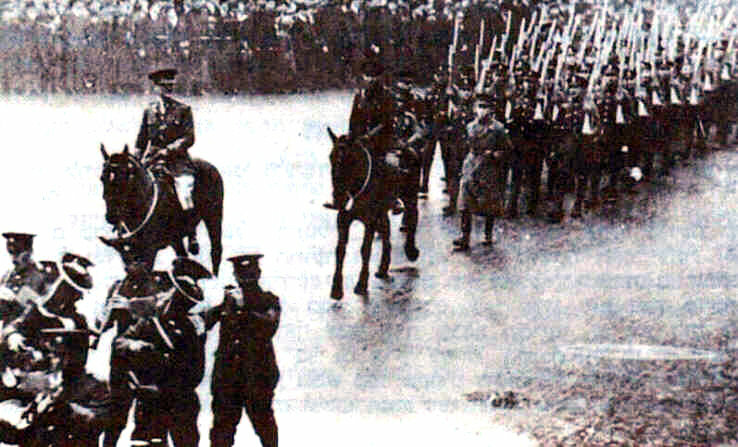 Pathe filmed parts of the parade and made a few films of the soldiers in their uniforms and boxing. After the parade, the 38th Battalion marched to Waterloo, joined their comrades in Southampton and were shipped out for overseas service. Appropriately, they went to Palestine and performed good service in the holy land.